Make your point in life size color with a 8 foot by 4 foot printed banner. Printed directly to vinyl banner material using sun and weatherproof UV ink technology, this banner is perfect for indoor or outdoor use. Simply upload your graphic file and we do the rest. Make your point with a full color 6 foot by 3 foot banner. This full color digital vinyl banner is printed using Latex ink technology to that is UV & weather resistant. This banner is perfect for indoor or outdoor use. Make your point in life size color with a 5 foot by 3 foot banner. Printed directly to vinyl banner material using sun and weatherproof Latex Ink technology, this banner is perfect for indoor or outdoor use. 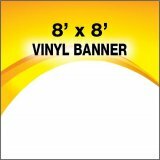 Make your point in life size color with a 4 foot by 2 foot banner. Printed directly to vinyl banner material using sun and weatherproof Latex Ink technology, this banner is perfect for indoor or outdoor use.